LAS VEGAS (July 15, 2018) – He entered the World Series of Poker (WSOP) Main Event poker tournament for $10,000 on July 2 and started with 50,000 in tournament poker chips with no monetary value. He leaves on July 15 with all 393,700,000 chips from the 7,873 other hopefuls who entered, along with the $8.8 million first place prize, the diamond-encrusted World Series of Poker gold bracelet, and the title of 2018 World Series of Poker Main Event Champion. 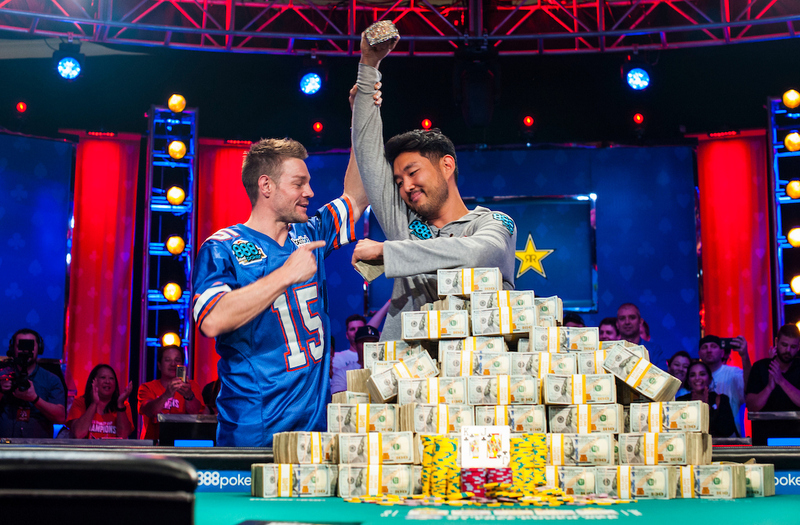 Northbrook, Illinois’ 33-year-old John Cynn is the new world champion of poker. Cynn captured his very first World Series of Poker (WSOP) gold bracelet and the top prize of $8,800,000 in gaming’s richest and most prestigious event after a three-day finale telecast live on ESPN that concluded at 4:51am in the Rio All-Suite Hotel & Casino’s Amazon Ballroom on Sunday morning. Amazingly, Cynn finished in 11th place in this event just two years ago, winning $650,000. He had twelve previous cashes at the World Series of Poker heading into this event. 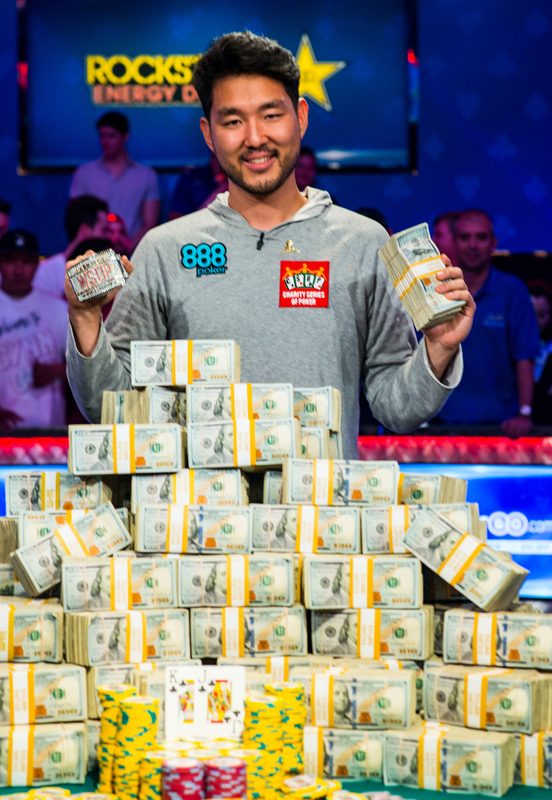 His total live tournament winnings sat at $944,786 leading into this year’s WSOP Main Event. A former logistics analyst, Cynn was laid off from his job and started playing poker. He’s played professionally for the past five years. The runner up was 32-year-old Tony Miles from Jacksonville, Florida who missed out on his first WSOP gold bracelet, but still walked away with $5,000,000. He had only cashed two previous times at the WSOP for $6,396, but was the chip leader at several times and was in the thick of the action throughout the final table. His previous best finish was an $18,000 cash for third place in a local event in Jacksonville. His live tournament winnings totaled $54,333, and this marked his first ever cash in the WSOP Main Event. 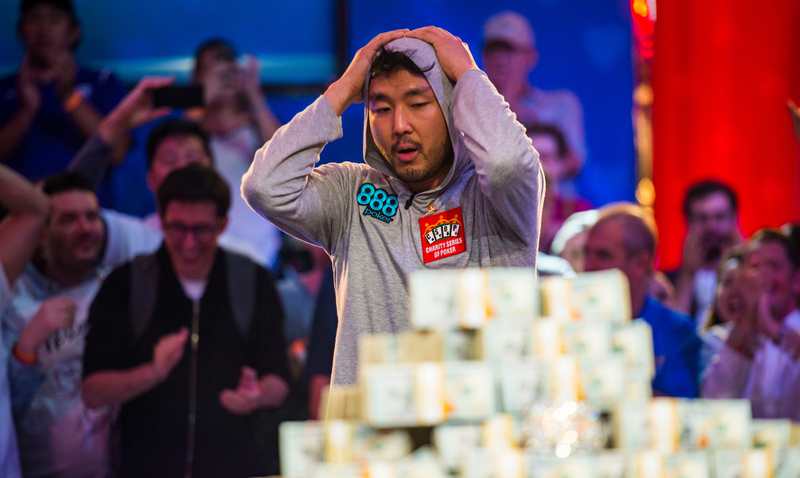 On the final hand of this 11-day poker game, Cynn raised the pot to nine million. Miles made it 32 million and Cynn called. The flop brought the King of Hearts, the King of Diamonds and the Five of Hearts. Miles led out for 32 million and Cynn called. The turn card was the Eight of Diamonds. Miles chose to move all in for his remaining 114 million chips and Cynn went deep into thought trying to decide what to do. He eventually made the call, putting Miles at risk to be eliminated. The cards were turned over and Cynn showed King of Clubs, Jack of Clubs, for a flopped three of a kind, while Miles tabled Queen of Clubs, 8 of Hearts, for two pair, Kings and Eights. That made the river card irrelevant, and once the dealer turned over the river card – a Four of Spades, it was official. Cynn had all 393,700,000 stacked in front of him. Cynn and Miles went toe-to-toe for ten and a half hours over two days, with Cynn finally dispatching his formidable challenger in the wee hours at the Rio All-Suite Hotel & Casino in Las Vegas. From an event that began way back on July 2, 2018 with 7,874 hopefuls who each ponied up the $10,000 entry fee and received 50,000 in starting tournament chips, Cynn ultimately outlasted them all – the second-largest starting field in the 49-year history of the tournament. The total prize pool up for grabs in the event was $74,015,600. The event ended with 8 minutes and 50 seconds left in Level 44 of the tournament, which equated to 87 hours, 51 minutes and ten seconds of poker play to reach a victor. In real time though, the event took 11 playing days, spread out over 14 calendar days to become the champion. When play began on July 2, players started with 50,000 in chips and the blinds were at 75 and 150. When play completed late Saturday night at the Rio All-Suite Hotel & Casino in Las Vegas, blinds were at 2,000,000 and 4,000,000 with antes of 500,000. Three-handed play began Saturday evening at 5:30 pm PT in Level 40 with blinds at 800,000-1,600,000 and antes at 200,000 per player. At 6:20 pm, Michael Dyer put his remaining 22,200,000 chips in the pot holding Ace of Hearts, 10 of Diamonds. Chip Leader Miles made the call and turned over the Ace of Spades and the Jack of Hearts. The board ran out Queen of Clubs-Five of Spades-Three of Diamonds-Jack of Clubs-Queen of Hearts, giving Miles two pair, Queens and Jacks to eliminate Dyer, who entered the final table second in chips. Dyer, a 32-year-old professional poker player from Houston, Texas earns a nice payday of $3,750,000 for his third place finish. With $95,020 in career live poker tournament winnings heading into this event, including three previous WSOP cashes for $71,515, this is by far the biggest monetary prize Dyer has won in a live poker tournament. Heads up play started with players fairly even in chips with Miles starting with 203,500,000 and Cynn with 190,300 on Hand 244 of the final table at 6:25 pm. The end came on hand number 442. This marked the longest heads up match in WSOP Main Event history at 199 hands. Friday’s action was carried on a 30-minute delay on ESPN, to conform to local gaming regulations. Tonight’s finale was carried on ESPN as well. More than $28 million of the $74 million+ prize pool was divvied up amongst the final nine players. A record total of 1,182 individuals cashed in the event. 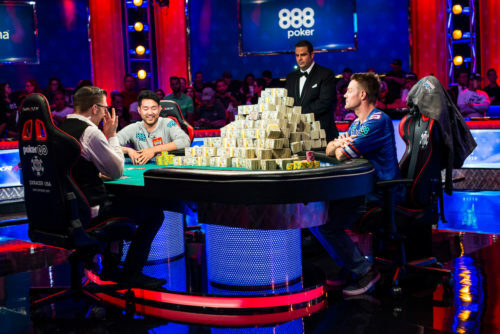 The WSOP Main Event play was paused on July 11 when the tournament reached its final nine players. It resumed the next day, on Thursday, July 12 with one hour, 23 minutes and 57 seconds remaining in Level 36, with antes of 100,000 and blinds at 300,000 and 600,000. Play lasted 4 hours and 26 minutes in real time on Thursday, but consumed 3 hours, 23 minutes of actual tournament time and led to the elimination of three players. Friday’s play started at the beginning of Level 38 with blinds at 500,000 and 1,000,000 with a 150,000 ante. Three more players were eliminated over the course of 5 hours, 9 minutes of poker play and ended in Level 40 (200,000 antes, with blinds at 800,000 and 1,600,000), with 51 minutes and 10 seconds left in the level. In real time, play began at 5:35 pm in Las Vegas and concluded for the night at 12:31 am when we lost Manion. The 2018 WSOP has attracted a record 123,838 entrants this year, exceeding last year’s record of 120,995 with one event still remaining – the $1 million buy-in Big One for One Drop charity No-Limit Hold’em tournament which directs funds to OneDrop.org and kicks off later today. A record prize pool has been awarded – more than $242 million thus far at the 2018 WSOP. This year’s WSOP featured participants from 110 different nations. The World Series of Poker (WSOP) is the largest, richest and most prestigious gaming event in the world awarding millions of dollars in prize money and the prestigious gold bracelet, globally recognized as the sport’s top prize. Featuring a comprehensive slate of tournaments in every major poker variation, the WSOP is poker’s longest running tournament in the world, dating back to 1970. In 2018, the event has attracted 123,838 entrants from 110 different countries to the Rio in Las Vegas and awarded over $242 million in prize money. In addition, the WSOP has formed groundbreaking alliances in broadcasting, digital media and corporate sponsorships, while successfully expanding the brand internationally with the advent in 2007 of the World Series of Poker Europe. For more information on the World Series of Poker, please visit www.WSOP.com.